How do I see how many points my students have earned this year or over a certain time period? 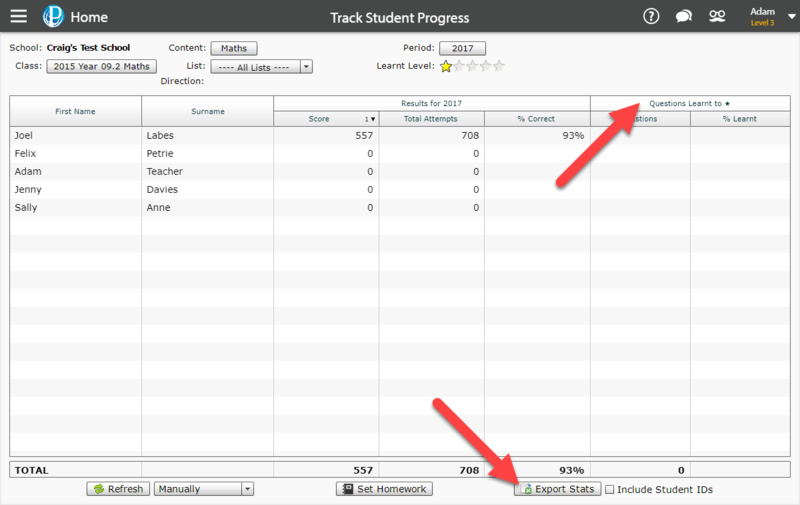 Track Student Progress is a tool that can be used to view student points. You can find data for particular pieces of content over specific time periods. 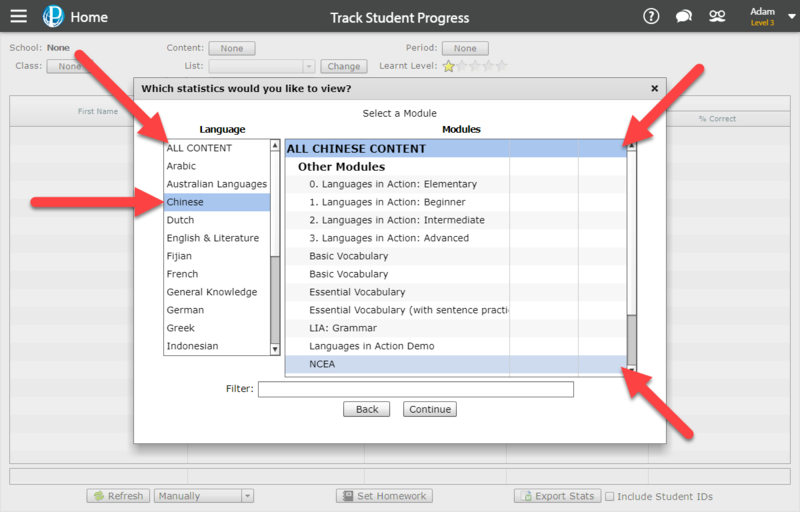 The Track Student Progress section is particularly helpful for finding specific data on students' points — something that can not be tracked in the Student Usage and Data section. 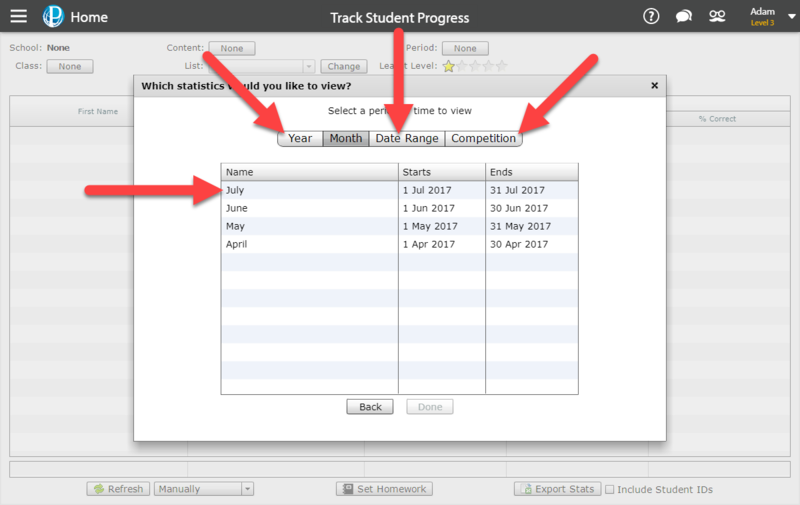 Start by clicking on the Student Usage & Data section of your Control Panel, scrolling down and selecting Track Student Progress. If you cannot find this option, you will need to enable Flash on your browser. We have articles on how you can do this on Google Chrome and Safari. 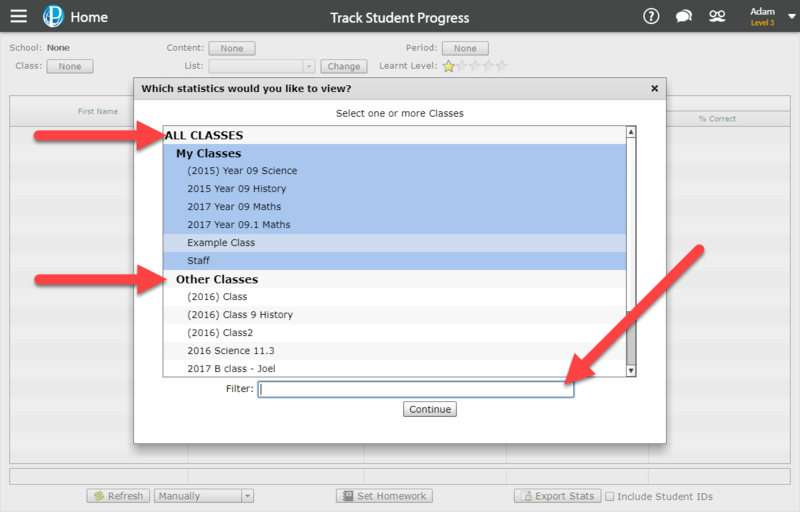 Select the classes for which you would like to view data. To select all classes, click on the All Classes button. To select only your classes, click on the My Classes button. To search for specific classes, use the search bar at the bottom of the page. You can select multiple classes by holding down the Control key on your keyboard and clicking on each relevant class. Select the type of content for which you would like to view data for. First, select a subject in the menu on the left-hand side. To select all of the subjects, click ALL CONTENT. Once you have selected a subject, select the modules for which you would like to view data for in the menu on the right-hand side. Select which time period you'd like to view data for. Selecting Date Range will enable you to view the data for a custom time period. The Competition tab will enable you to view data during both inter-school competitions like the Language Champs as well as data for intra-school competitions. There are a set of two columns that display Questions Learnt to a given Star rating. The selected filters can be changed by using the buttons and menus at the top of the page. To export the data into a spreadsheet, click the Export Stats button at the bottom of the page. There is also a checkbox here that will allow you to include student IDs with the exported data. When a Date Range is selected for the Period, only the Points/Stars Earned column will be displayed. To see additional data, use one of the Year, Month or Competition views.